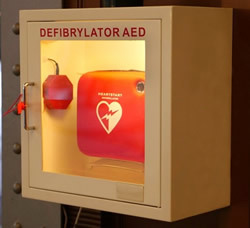 Using an Automated External Defibrillator (AED) on a person who is having sudden cardiac arrest (SCA) may save the person’s life. The most common cause of SCA is an arrhythmia called ventricular fibrillation. This is an irregular heart beat that cannot sustain life. An AED can analyze the heart rhythm and determine if a shock is required; an electric current is delivered to the heart through the victim’s chest wall through the adhesive electrode pads. The shock delivered by a cardiac defibrillator interrupts the chaotic rhythm and allows it to return to normal. Come and learn how to use an Automated External Defibrillator and how it can save a life! Dress and Skate Sale – One Day Only! Members may drop off dresses and skates at the rink on Friday evening, Feb. 23 between 5-6:00pm and Saturday morning between 8:30-9:00am. Un-sold items are to be picked up the end of the sale on Saturday. If you are dropping off items to sell they must be clearly marked with your name and price. The Mentor Figure Skating Club is pleased to announce a scholarship for the 2018 graduates of the club who plan to attend college. Every year MFSC offers a $500 scholarship to a current 3-Year Full Club Member who shows academic achievement, leadership skills, skating success and community involvement. Applications are reviewed by an anonymous panel of professionals and educators who rate each question using a rubric system. Any High School Senior who is a current MFSC 3-Year Full club member is eligible for the scholarship given by the club. Below, please find the requirements. No person related to the club is on the panel including the Chairperson. Application Deadline is April 16, 2018. Completed application packets should be sent to: Suzanne Clemente, Scholarship Chair, 7564 Fairview Ave., Mentor, Ohio 44060 or placed in the Clemente’s mailbox at the rink. Download the 2018 Scholarship Application. The North Eastern Ohio Elementary School Ice Skating Championships will be held at the Mentor Civic Center Ice Arena on Saturday, March 10, 2018. All pre-school, grade school and bus program students are eligible to participate! Skaters will compete and earn points for their school. Events offered include Skating Skills, Free Skate, On-ice Races, Hockey drills, and Synchro Skills. The school with the most points will win the championship trophy for their school. All participants will win a medal for their event. Download the flyer to hang up at your school. Coming to Mentor, OH on July 16, 2017 immediately following the Mentor Sunshine Invitational Competition! The Skate Dance Dream Performance Camp will be offered on Sunday, July 16, 2017 from 1:30 pm – 7:00 pm. The camp is a half-day Fusion Dance-to-Ice Clinic. Please pay at the desk before entering the ice. Skaters must wear the sticker they are given. Cost for the ice is $13 per hour.